So what did Sijilmassa look like, back in the day? A long, thin city, bordered by a canal on one side, surrounded by a walled oasis. The famous traveller Ibn Battuta came to Sijilmassa in 1352-3 on his way to the Mali empire. Comparing Sijilmassa to cities in China, Ibn Battuta described Sijilmassa as including “orchards and fields and their houses in the middle,” making the city as a whole very large. 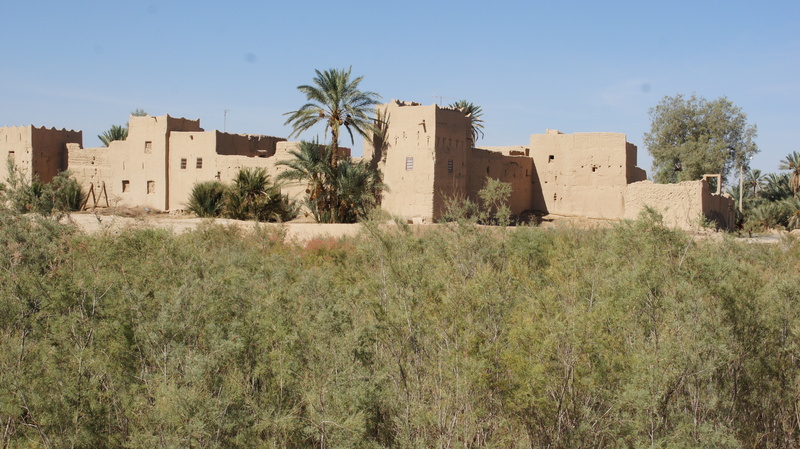 These houses were undoubtedly different from the fortress-villages of the qsour, but this description shows an established pattern that the later qsur may have built on. 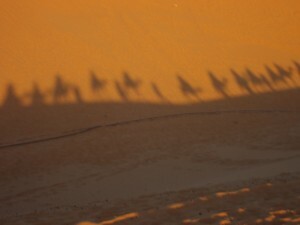 Ibn Battuta spent four months in Sijilmassa, preparing for a two-month Saharan caravan crossing. Camels were traditionally fattened for several months in the area around Sijilmassa to prepare them for the arduous journey. 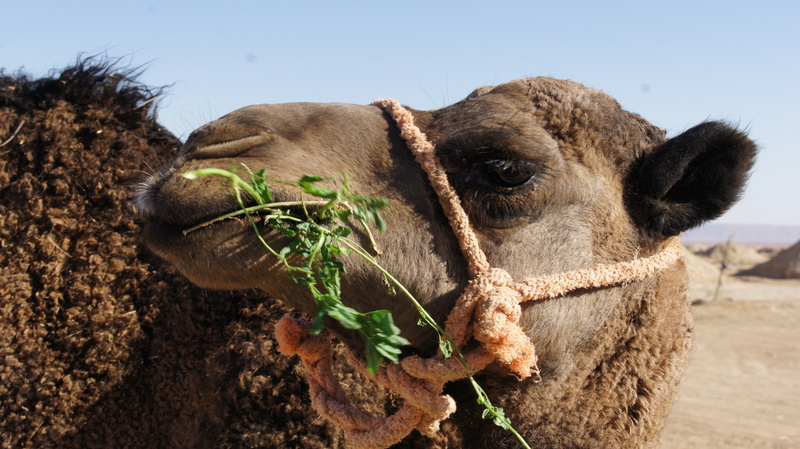 Ibn Battuta also noted that the average trans-Saharan caravan included 1000 camels; large caravans might include as many as 12,000 camels. 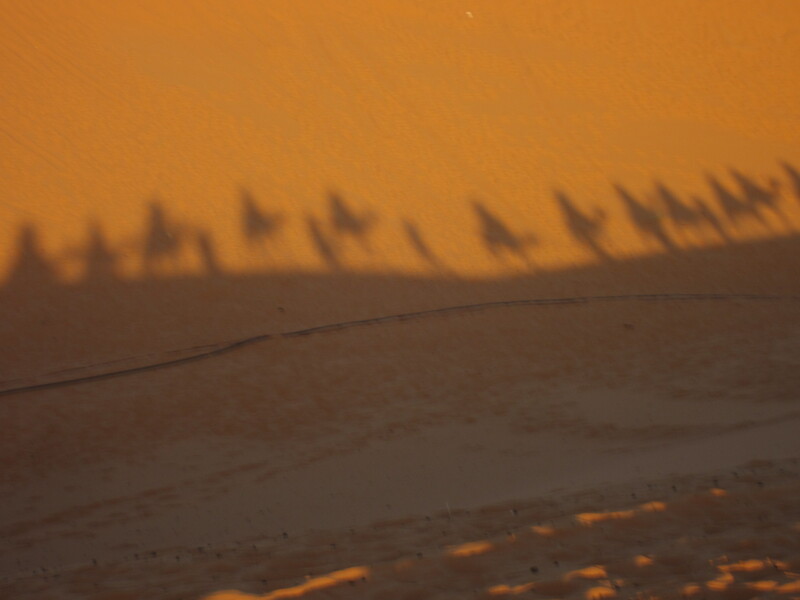 Miles and miles of camels. Mindboggling. You wouldn’t want to be at the back of the queue. The city was built in a plain, on the Ziz, and was encircled by a high wall of which one can still see some parts…. Sijilmassa had fine temples and colleges supplied with numerous fountains whose water came from the river. Great wheels took this water from the Ziz and projected it into conduits bringing it into the city. 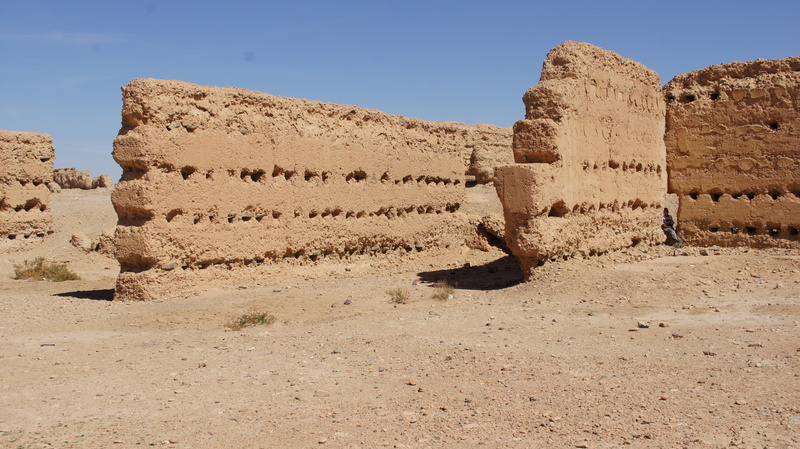 Back when the people were all agreed, they built…walls to stop the incursion of Arab horsemen. While the people were united, with a common will, they remained free. But factions arose, and they demolished these walls and each [group] called upon the Arabs to protect them. So it is that these people have become the subjects and almost the slaves of the Arabs… always fighting each other, doing as much harm as they can, which is to say damaging the irrigation canals which come from the river, [or even cutting] off palm trees at their trunk and steal[ing] from each other, which the Arabs abet. 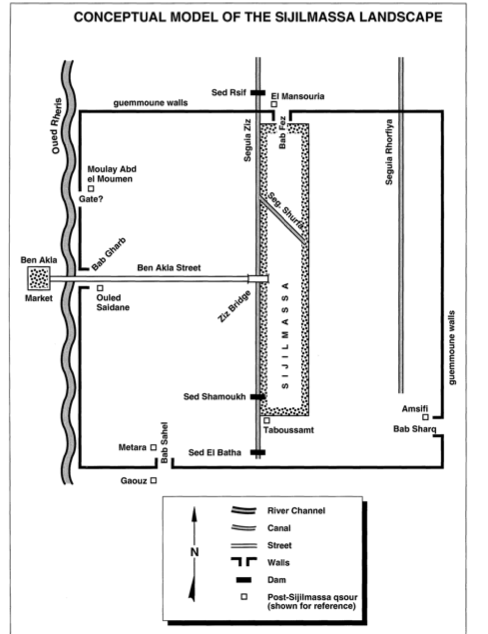 You could almost say that when, in the early twentieth century, the French and their Moroccan collaborators destroyed irrigation canals and sabotaged water resources, “manufacturing a fifteen-year-long drought, followed by the 1944-5 famine” (Ilahiane), they were following something of a time-honored tradition. Now, the al-bayud fungus is one of the greatest threats to the palmerie. Kind of a relief–or maybe not, depending on how seriously your palm tree is infected. What remains of Sijilmassa today are actually the ruins of a mosque built in the 1600s and 1700s by the Alawite dynasty. These are atmospheric if somewhat misleading: I spent ages imagining (incorrectly) thousands of camels parading through these walls. *****Quotes drawn from from Dale Lightfoot and James Miller, “Sijilmassa: The Rise and Fall of a Walled Oasis in Southern Morocco.” Photos from Tafilalt visit with John Shoup and Eric Ross.